Norfork Lake's winter fishing pattern is in full swing. The bait fish are in the deep water channels of 80 - 100+ feet and the bait are suspended 50 - 70 feet down. 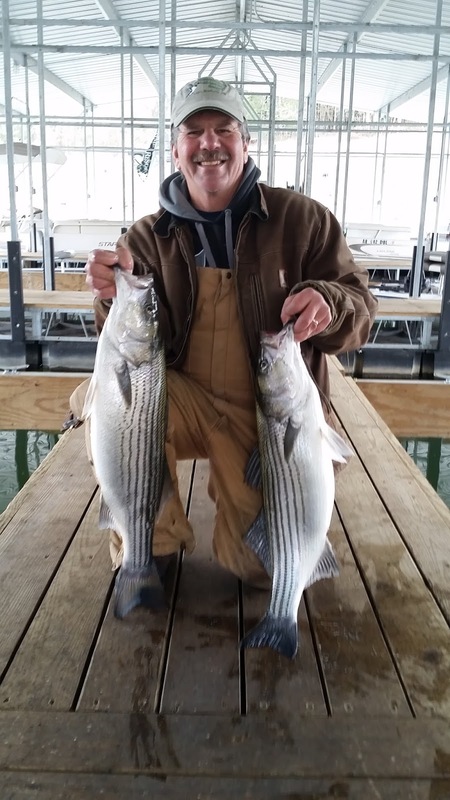 Striped and hybrid bass can be found following the bait fish whether it is on the main lake or back in the major creeks. For most of last week I was fishing in the 62 bridge area, mainly to the south of the bridge. Later in the week the fish moved in between the 2 bridges. 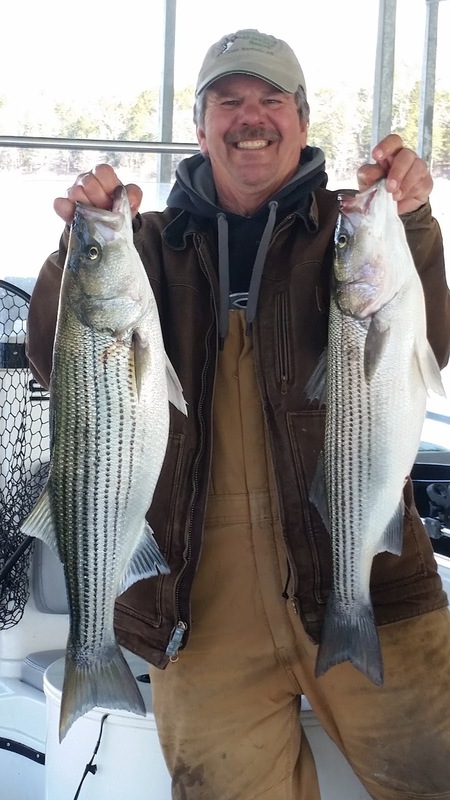 Today I was only marking a few stripers, so after a couple hours of looking and fishing with minimal success I decided to move into Float Creek. Immediately I was marking large balls of shad with small schools of stripers following. For the next hour it was total havoc on my boat. I was by myself with 4 live bait poles out. I had doubles on several times and ended up boating 5 stripers, but missed as many. 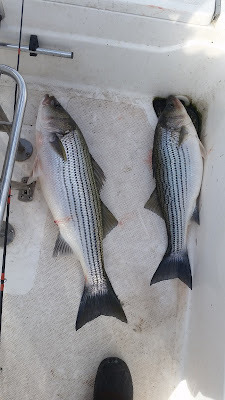 I had bait set at 40, 50 and 60 feet deep, but all my strikes came from the 40 and 50 feet deep baits even though I was marking many fish 60 + feet deep. Today was the first day in over a week that vertical jigging with a spoon would have worked great since I saw multiple fish at one time at same depth. Large shiners, big river chubs and thread fin shad are the best choices for live bait. 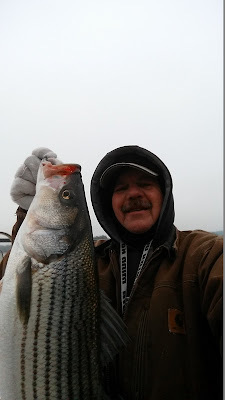 I had to clean one striper this morning since it could not swim away and found that its belly was full of 1 - 3 inch thread fin shad. If this winter is typical, the fish should stay at this depth and in these areas for the next 3 - 4 weeks. Towards the end of February and beginning of March the major creeks will be great places to look. 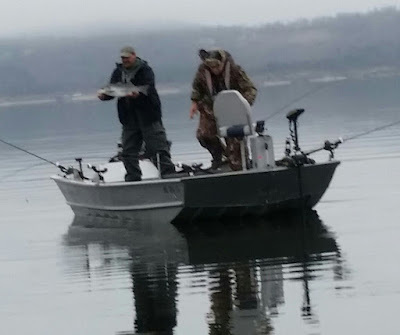 The fish will start to go toward shallower water following the bait. Small and largemouth bass, as well as, Kentucky bass fishing has also been good. The bass can be found along the deep water bluff lines. I have found many bass suspended 30 - 50 feet down in 60 feet of water. Early and late in the day they are moving in a little tighter to the shore line 15 - 25 feet deep, but still on the bluffs. You can vertical jig with a spoon, but this method can be difficult with suspended fish. Try casting out a grub, small spinners or blade baits to catch these suspended fish. On the windy days throw a spinner bait. Jig & pigs, other types of plastics and deep diving crank baits are also a good choice for the fish that move in tighter to the shore early and late in the day. Another good place for the Kentucky and Largemouth bass is near deep brush piles. Work the bottom with a spoon around the brush and you will pick up some nice fish. Crappie are on and near the deep water brush piles. Look at sunken brush in 30 - 50 feet of water. The crappie will be inside of the brush (these are typically the bigger ones) as well as suspended over the brush. At times you will find them only 10 feet deep, but I have more success at 20 + feet deep this time of year. The Norfork Lake level is currently stable, but has been falling slowly and sits at 547.88. The water temperature is fluctuating between 48 - 50 degrees. The warm days and nights are rising the water temperature slowly. The main lake is clear in most areas and the creeks and coves are stained. 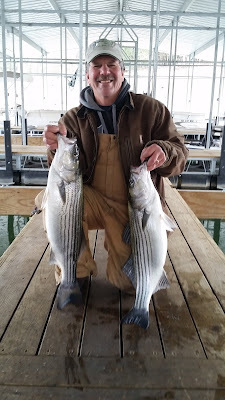 Currently Norfork Lake is in excellent fishing condition and the fish that I have been catching are fat and energetic. Make your plans now to come catch a few!